PUTRAJAYA, Sept 29 — The Federal Court upheld today the one-year jail term previously meted out to Dr Mohamad Khir Toyo, after the former Selangor mentri besar lost his final appeal against a corruption conviction. 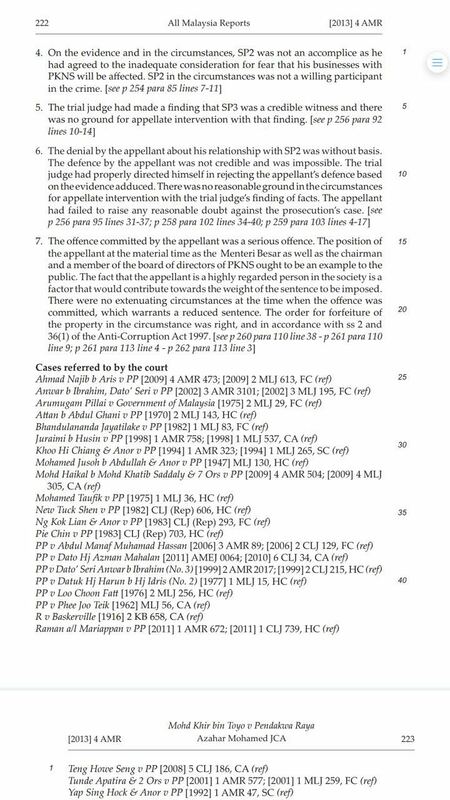 The apex court also maintained the forfeiture of the land that he had underpaid for back in 2007. Chief Judge of Malaya Tan Sri Zulkefli Ahmad Makinudin, who chaired the five-man panel, said among other things that public interest should always be the first and foremost consideration in sentencing. “We unanimously dismiss the appeal against sentencing. We therefore affirm the sentence of one-year imprisonment meted out by the trial judge,” Zulkefli said, adding that corruption in any form should not be condoned. Mohamad Khir, 50, is a licensed dentist who had served as Selangor mentri besar for eight years up until 2008. Tan Sri Muhammad Shafee Abdullah had last week sought for a fine for Mohamad Khir or an order to provide free dental care to the poor as community service instead of a jail term as his client was a first-time offender, among other things. But the Federal Court noted that Mohamad Khir had, as a public servant and chief executive of Selangor, taken advantage of his official position, with one of Section 165 of the Penal Code’s purpose to prevent that kind of corruption. “Corruption in all manner and form cannot be condoned. A fine would not send that message. Neither would community service,” Zulkifli said, noting that community service is only an available option for youthful offenders and under the Offenders Compulsory Attendance Act 1954 which does not apply to this case. The judge also noted that the offence that Mohamad Khir had committed was not “trivial” as it destroys public confidence in the government, with imprisonment a right and proper punishment that is also not excessive. The Federal Court dismissed Shafee’s arguments that Mohamad Khir should only be made to pay half of the difference between the RM3.5 million paid and the actual fair value of the land, ruling instead that the land should instead be seized subject to an existing charge to the bank. Last Tuesday, the Federal Court panel ruled that the offence was proven beyond reasonable doubt when it unanimously upheld Mohamad Khir’s previous conviction under Section 165 of the Penal Code, which comes with a maximum two-year jail term or fine or both. The other judges on the Federal Court panel are Tan Sri Jeffrey Tan Kok Wha, Tan Sri Ahmad Maarop, Tan Sri Hasan Lah and Datuk Ramly Ali. 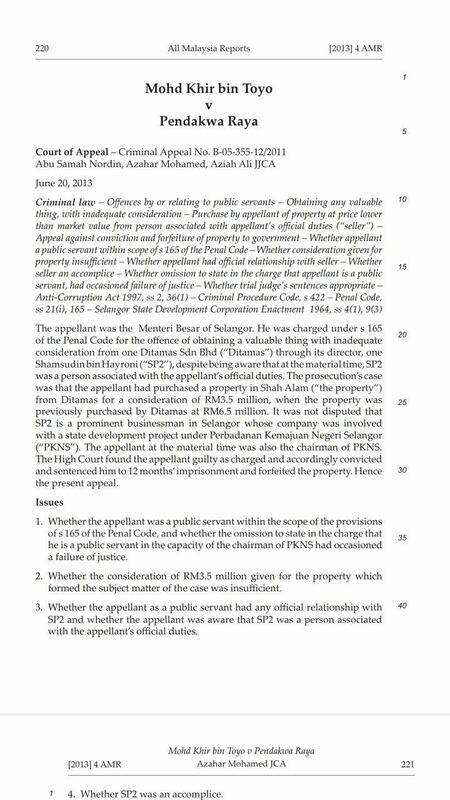 On December 23, 2011, the Shah Alam High Court convicted Mohamad Khir of corruptly using his position as then Selangor MB and Selangor State Development Corporation (PKNS) chairman to obtain land and property below the market price in 2007. He was given a 12-month jail sentence after being found guilty of obtaining two plots of land and a bungalow in Section 7, Shah Alam for himself and his wife Zahrah Kechik, from Ditamas Sdn Bhd through its director Datuk Shamsuddin Hayroni with the inadequate payment of RM3.5 million in 2007. He was charged with knowingly obtaining a valuable thing as a public servant without paying adequate consideration for the property that Ditamas had itself purchased at RM6.5 million in December 2004, and doing so with the knowledge that Shamsuddin had official dealings with him. On May 30, 2013, Mohamad Khir lost his appeal at the Court of Appeal against his conviction and one-year jail term. 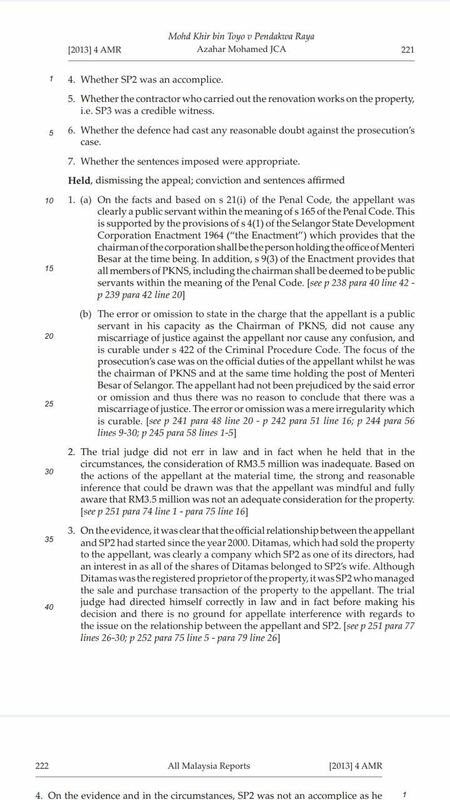 I think there are lots of similarity with the LGE case ...though the sales and purchase between a public servant and a member of the public is not a problem in itself but if the prosecution can show that the seller benefit somehow from the Government that LGE leads it will be an offence like what happened to Khir Toyo. Interesting how the court trial will unfold, interesting because LGE does not have to be in this current situation as he as CM is entitled to a official State House. Wallahualam.